Man! That’s really cool. I forget where you got the idea to make this from? I might have to make one too! 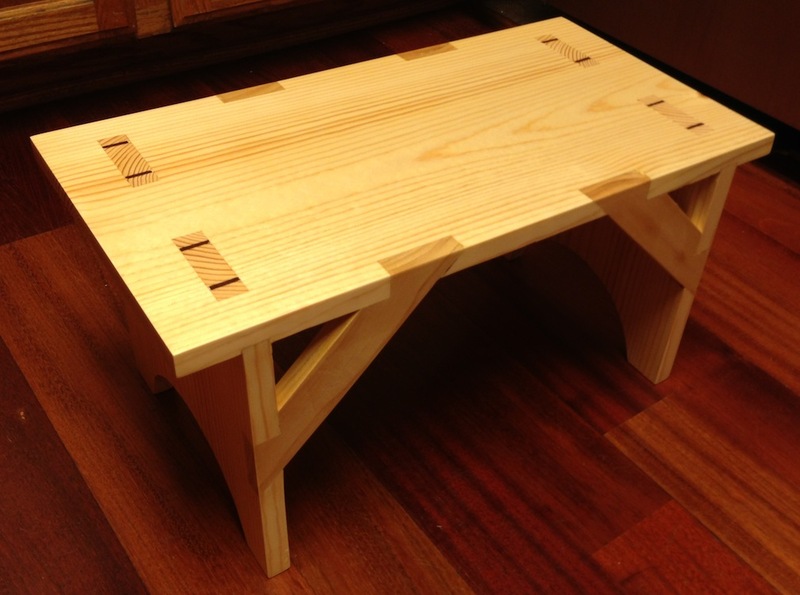 The new issue of Fine Woodworking has an article on this, but accidentalwoodworker.com was where I saw it first. Very nice. The wedged through tenons are a nice touch. Thanks Jamie, I’m happy with the result. It was a great practice project. Very nice looking stool. Your cross brace joinery looks dead nuts. Thanks Ralph. 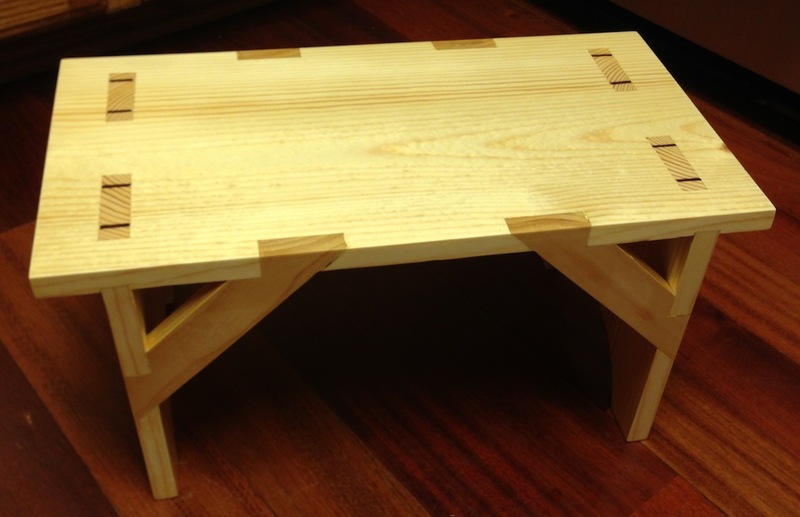 The cross-brace joinery is OK, I’ll do it better next time. 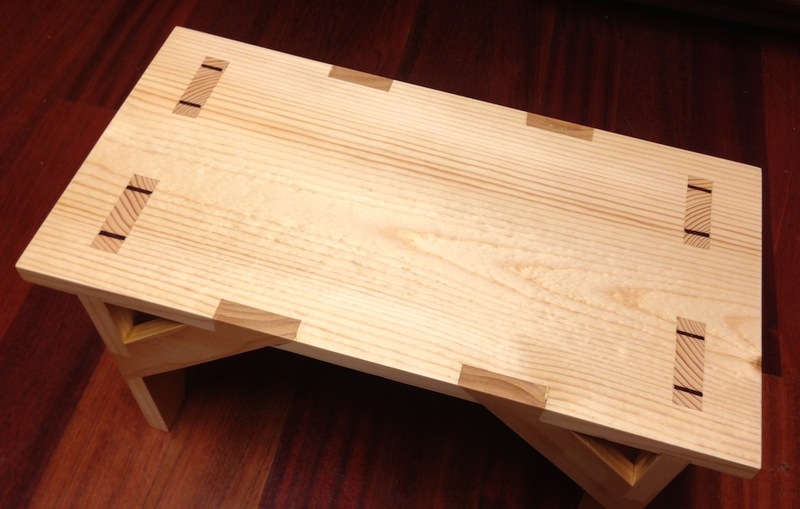 This is a great piece to practice dados, M&T and dovetail laps. It’s small enough that it goes (relatively) quickly. PS: I’ve decided that I really like using shellac as a finish. In the past I’ve always been more of a “oil” or “wiping varnish” person. I still really like that on figured woods to bring out the color and pattern in the grain. But the rubbed and waxed shellac finish feels so silky smooth I really like it. And the fact that it can make cheap white pine look good is a huge plus. I read something in the latest “Flexner on Finishing” column in Popular Woodworking that is bothering me. It’s the article on wipe-on finishes. He mentions that a sample of “Tried and True” oil finish left to dry for 16 years is still sticky because it’s just raw linseed oil. I’ve been using their oil/varnish blend and am wondering about that. I’ve noticed that on some projects they seem to take “forever” to dry (my winding sticks for example — it’s been several weeks and I noticed yesterday that they still seemed slightly sticky/oily). I need to do some experiments I think to get a better handle on this. I like it. Looks like a good project for practicing jointery skills.